This DVD, part of Kino's "Lubitsch in Berlin" collection, covers four discs and five films, made between 1919 and 1921. This time we get a double feature of two shorter works, both comedies with the same lead actress. The Oyster Princess (1919) and I Don't Want to Be a Man (1920) star Ossi Oswalda, appearing in each film as "Ossi," and in each film, she is desire unrestrained, pursuing her interests with lusty vigor and occasional violence. In The Oyster Princess (Die Austernprinzessin) Ossi is the only daughter of oyster magnate Mister Quaker (Victor Janson), and someone used to getting her own way. When we meet her, she's in the middle of destroying a room in their ostentatious mansion. Ossi is outraged that one of her friends has married into nobility, and she wants her own prince. So, Mister Quaker, used to pacifying his daughter, calls up the matchmaker, who alerts Prince Nucki (Harry Liedtke), a down at heel prince who is reduced to hanging out with his pal Josef (Julius Falkenstein). Nucki sends Josef over to check things out, and once Ossi assumes Josef is the prince, things go a tad out of control. The film starts and ends well, with very funny material, but the middle occasionally bogs down. Everyone is game for fun however, with Janson getting the best moment at the end. Characters just look funny, and the sets bolster the comedy as well. The matchmaker's office and the Quaker home are the two best sets, with would-be grooms wallpapering the matchmaker's office. The Quaker home, filled with ridiculous numbers of servants and equally silly decor, is perfectly mated to the material. I Don't Want to Be a Man (Ich m�chte kein Mann sein) sees Ossi as a hellcat teen who likes to hang out with the men, play cards, smoke, and drink. When her uncle leaves on a trip, her new guardian Kersten (Curt Goetz) at first appears harsh and more than willing to do whatever it takes to break Ossi of her wildness. Fed up with being treated so shabbily due to her gender, Ossi decides to go out as a man, in order to experience the high life she yearns for. Running into Kersten at a club, she gets a surprise she didn't expect: she and Kersten hit it off. In the years since, we've seen all manner of drag-oriented films, so the general plotline isn't going to be striking for most. The apparent glee with which it is carried off, however, may have been shocking for some audiences in 1920, with such scenes as the "male" Ossi and Kersten happily kissing and nuzzling. Kersten turns out to be equally at home with whomever he's with, and Ossi discovers that being a man isn't necessarily any easier than being a woman, with its own set of rules and disadvantages. It's all handled in that light, breezy manner that doesn't make too much of anything and leaves everyone happy. If you're a fan of Lubitsch's American work, then you'd do well to look at works like these that show his fabled touch in its earlier period. Image Transfer Review: Both films are presented in transfers made from European restorations; I Don't Want to Be a Man is the lesser of the two films in terms of image; the contrast is sometimes too high, obscuring detail. Otherwise, Oyster Princess looks very good indeed, its main drawback being a few instances where the film speed seems to slow for a couple seconds before resuming normal runtime. The original German intertitles are replaced in each film with bland English intertitles. Audio Transfer Review: The score for each film is good enough, with Aljoscha Zimmermann's work on Oyster Princess the more appealing for me. Both scores are presented on clean tracks. 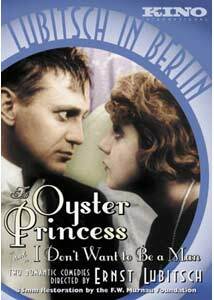 These two diverting shorter films from Ernst Lubitsch each have their high points, but The Oyster Princess is the real keeper for me. Filled with a rambunctious humor and amusing performances, it makes for a very enjoyable hour. I Don't Want to Be a Man holds less appeal, but has a witty performance from Oswalda to hold the interest.